Italian design, traditional or modern, is all about elegance, luxury, and touches of glamor added in an unexpected way throughout the whole living space. High-quality furnishings and accessories, gilt trims, tile, marble, and stone work together to create interiors with a unique, unmistakable look. Done with love for home and exquisite taste, Italian interiors offer functionality, comfort, coziness, and aesthetic appeal. Actually, Italian design has deep-rooted traditions. From Ancient Rome to the Middle Ages, to the Renaissance to modern-day Italy, this design style reflects Italians’ love of beauty and comfort. Being the epitome of luxury, Italian-style interiors in all their variations are highly admired and remarkably popular all over the globe. Do you find Italian-style spaces inspiring? If so, are you ready to lend your living space an Italian-style look? 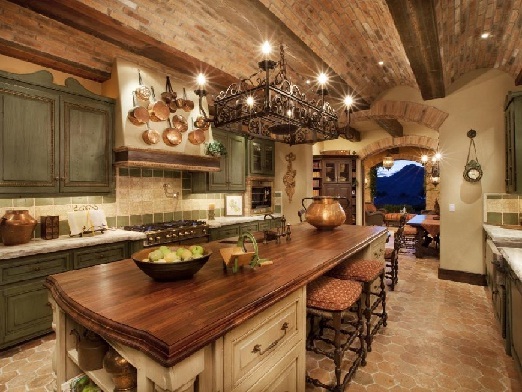 The timeless look of the traditional Tuscan décor is all about color, texture, and extensive use of natural materials. When it comes to colors, you can never go wrong with vibrant earthy tones from terra cotta, olive green, blues, and yellow umber to deep rusty reds and burnt orange to shades of peach, gold, and dusty pink. Usually, the colors are weathered or muted. The hand-plastered walls have an unmistakable textured look. If you like the look, an affordable way to achieve it is by using different faux finishing techniques. Stone is another wall solution. Furthermore, stone walls preserved over the centuries are left bare and kept as a central focus in many homes. This is a charming way for the people living in such homes to pay due respect to their ancestors and their hard work. Note that stonework/as well as brickwork/ is often used to highlight indoor and outdoor fireplaces and arches. Stone, marble, terracotta, ceramic tiles, and terrazzo/ made of recycled marble offcuts/ are all popular flooring choices. For bedrooms and living rooms, wood floors are also an option. Marble is used for kitchen and bathroom countertops and tiles – for kitchen backsplashes. Vaulted ceilings with exposed wood and brick and arches/including arched windows/ are a key feature of Italian Country style spaces. As for the furniture, it is inspired by centuries-long traditions and predominantly made of wood/ oak, chestnut, and cherry are favorite choices/, usually with a dull wax finish. Local artisans are still manufacturing replicas of furniture pieces from the past, such as chairs with woven straw seats, cabinets where to store and display beautiful tableware, armoires/especially mirrored ones for the bedrooms/, wrought iron headboards, chandeliers, tables, chairs, and more. Antique pieces of furniture are proudly displayed throughout Italian Country style homes. As accessories are an easy, relatively affordable way to embellish any space, Tuscan-style interiors are beautifully and opulently accessorized. Wall murals, tapestries, throws and throw pillows, bedding, window treatment, area rugs, hand-painted ceramic jars, plates, and canisters, pots, and pitchers, woven baskets, even copper cookware, and more in striking colors reminiscent of the landscape add to the enchanting atmosphere of Tuscan homes. Wrought iron chandeliers, sconces, and pieces of wall décor with a unique look are also a commonly used option to beautify Italian Country style interiors. Elegant candle holders in a plethora of designs and sizes are a favorite way to bring in extra doses of charm, romance, and personality. Note that vegetable, fruit, vine, and floral patterns are a natural choice for wall art and accessories, especially for kitchens and dining rooms. Flowers, whether potted in colorful ceramic pots or arranged in eye-grabbing hand-painted vases, and herbs are a popular option to add color, freshness, and scent to Tuscan-style spaces. 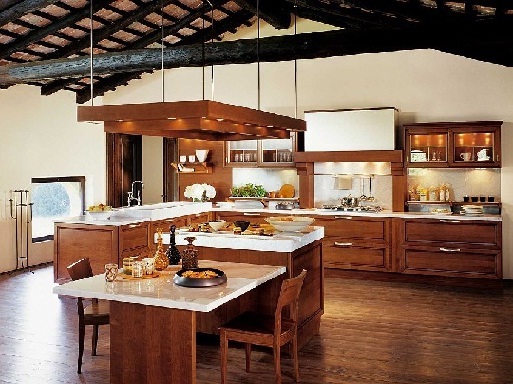 Above, a covet-worthy traditional Tuscan kitchen. Exposed brick and wood, a mind-blowing ceiling, terracotta flooring, sage cabinetry, displayed copper pots…A wrought iron chandelier of unique design adds touches of drama. An absolutely magnificent space! In the picture above, an adorable guest bedroom, exemplary for the style. 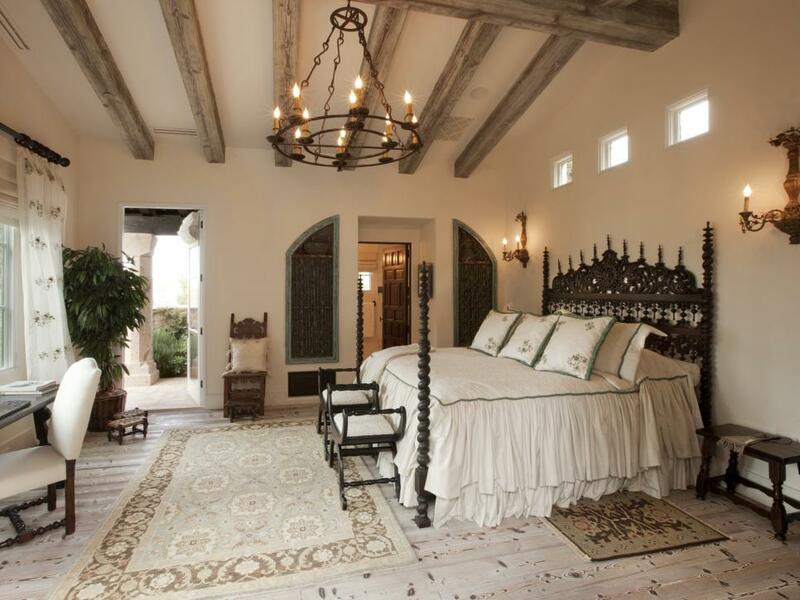 Exposed wood, elaborately carved wood furniture, a wrought iron chandelier and a pair of matching sconces…Light bedding and wall treatment and a neutral area rug soften the look of the dark furnishings. An oversized potted plant adds color and freshness. What actually immediately grabs the eye, is the ornate headboard. This bedroom is definitely pure perfection! Above, an exquisite formal dining room. 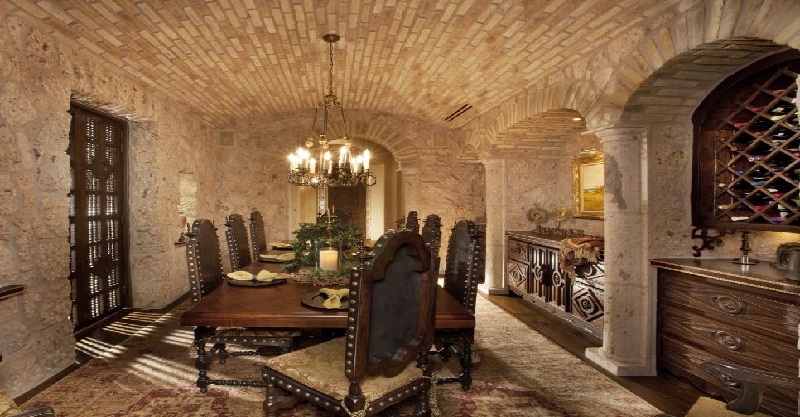 A round dining room complemented by statement dining chairs with leather seats and upholstered backs, an eye-grabbing chandelier, a beautifully framed large round mirror, unique wall décor…The area rug matches chairs’ upholstery. Definitely a space that exudes warmth, elegance, sophistication, and harmony! 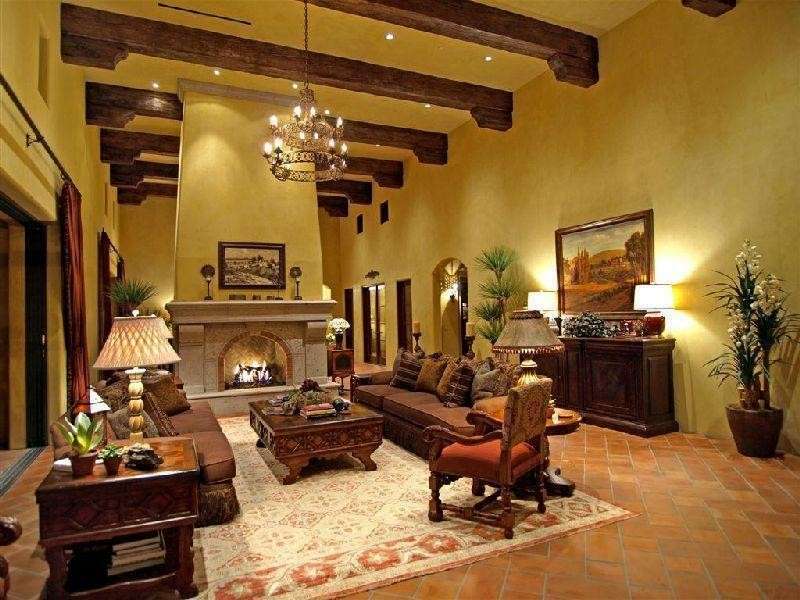 Above, a traditional Tuscan-style living room. Exposed ceiling wood beams, an imposing floor-to-ceiling fireplace, stunning ornate wood furniture, a gorgeous wrought iron chandelier, pieces of wall art, potted plants…Definitely an exemplary Tuscan-style space! Drawing inspiration from Italian rich culture and centuries-long traditions, contemporary Italian designers create interiors as elegant and luxury as the traditional Tuscan ones. Usually of minimal design, spaces are open, airy, filled with natural light, and often rather monochromatic. Although not so ornate and rather clean-lined, furnishings are made from high-quality materials. Wood, stone, marble, and tile are still extensively used. Glamorous lighting fixtures and stylish accessories help create exquisite spaces. Generally, modern Italian interiors are refined, charming in the unmistakable Italian way, and adapted to the needs of today’s people in terms of functionality and comfort. Above, a contemporary dining room. A breathtaking chandelier drops directly over a unique dining table. Upholstered dining chairs complement the table. Matching pieces of furniture and wall art create a sense of harmony and balance. Stylish accessories add to the appeal of the space. Above, a mind-blowing contemporary kitchen. Wood flooring, cabinetry, and an island, marble countertops, unique lighting, beautiful tableware… An oversized standing candle holder adds extra doses of visual interest. Potted herbs and cut flowers bring in color, freshness, and scent. What a space! Above, a contemporary bedroom of minimal design. A unique bed immediately grabs the eye. A black accent wall, a black round area rug, wall art, and bedding add color and visual interest. This flooded with natural light, airy space is the epitome of elegance and sophistication! Tuscan décor is rather a way of living than simple decorating. 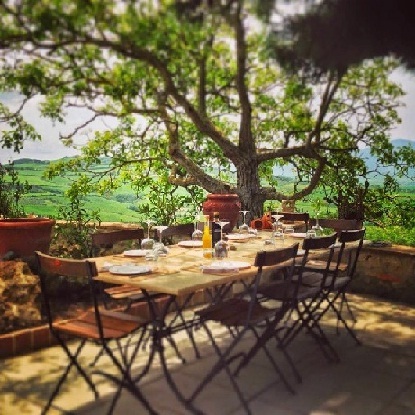 Outdoor living is an essential part of Italian life. Furthermore, as Italians cherish their traditions, spending time in the open air enjoying the company of family and friends is a favorite pastime. Whether on terraces/including rooftop ones/ and balconies or in courtyards under the shade of grapevines and olive and fruit trees, outdoor living is a pleasure and fun for all Italians. Note that alfresco dining takes a key part of the outdoor living. Traditional or with a modern twist, against the background of breathtaking landscapes and the unique look of Italian country homes, outdoor décor offers functionality, charm, and appeal. Comfortable seating arrangements and dining and lounging areas, usually shaded in one way or another, are complemented by fireplaces, pools, trellises with climbing greenery, fountains with Old-world charm, terracotta pavers, and colorful mosaic tile to create welcoming, cozy spaces with undeniable charm, tons of personality, and a distinctive organic vibe. 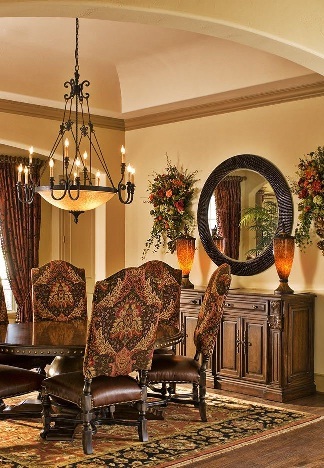 Wrought iron lighting and accessories add touches of drama and extra visual interest. Lush greenery/potted and planted/- shrubs, flowers, and herbs, bring in color and scent. Above, alfresco dining. A picture-perfect setting for dining and entertaining with family and friends! 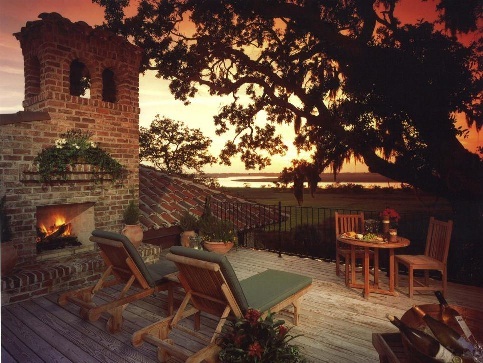 Above, a stunning deck. Definitely a charming space to spend some time enjoying the view! With its unmistakable look and unquestionable charm, Italian-inspired décor, traditional or contemporary, epitomizes elegance, luxury, and sophistication.